1p., 12mo. On 24.5 x 18.5 cm. piece of thin wove paper. In fair condition, on aged and worn paper with damage to extremities. A scarce and intriguing survival, about which nothing has hitherto been discovered. Printed in heavy black type characteristic of the early nineteenth century. 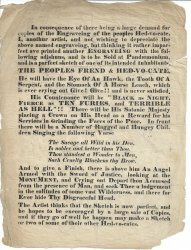 The first paragraph reads: 'In consequence of there being a large demand for copies of the Engraveing [sic] of the peoples Hed-vo-cate, I, anothur [sic] artist, and not wishing to depreciate the above named engraveing, but thinking it rather imparfect ave printed anuther ENGRAVEING with the following adishuns, and is to be Sold at Pandaemonium, and is a parfect sketch of one of its intended Inhabitants, | THE PEOPLES FREND & HED-VO-CATE, | He will have the Eye Of An Hawk, the Tooth Of A Serpent, and the Stomack Of A Horse Leach, which is ever crying out Give! Give!! and is never satisfied.' The text continues in the same vein, with the second paragraph containing the four lines of verse: 'The Savage all Wild in his Den, | Is nobler and better than Thou. | Thou standest a Wonder to Men, | Such Cruelty Blackens thy Brow.' 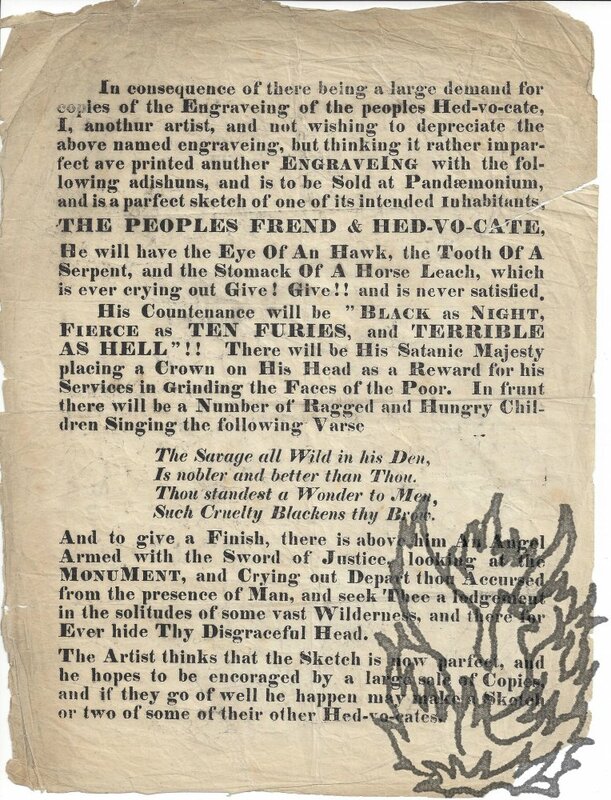 The last paragraph reads: 'The Artist thinks that the Sketch is now parfect, and he hopes to be encoraged by a large sale of Copies, and if they go well he happen may make a Sketch or two of some of their other Hed-vo-cates.' Excessively scarce: no copy on COPAC or OCLC WorldCat.